Swarm Fund ICO: Swarm Fund’s mission is to democratize finance, allowing all people to share the best deals and opportunities, regardless of investment size or value. Swarm Fund is a fully decentralized capital marketplace platform built on blockchain technology that is entirely owned by the community. Their governance-first model is designed to bring real assets into the blockchain world by creating a platform for regulatory engagement and a fully compliant legal container for highly profitable and scale-able real assets. Built on successful network models like Visa, the infrastructure is fully accessible and governed by community members. 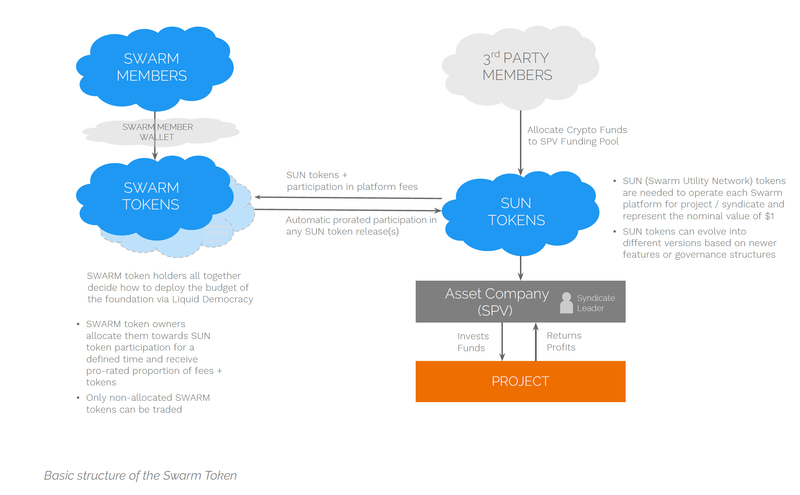 Swarm fund is a token based, stake weighted, liquid democracy system which provides early adopter incentive through membership and input into long-term decision making. This is enhanced by a reputational system layered over the network, which streamlines capital deployment. Their market infrastructure allows funds to automate the creation, fundraising, deployment, distribution, and reporting via an enhancement of currently available smart contract technology. Systems are a product of their incentives. If the old-world finance model has incentives for protectionism and hierarchy, Swarm Fund has incentives for early identification of talent and rewards that proportionally follow the high performance. Swarm Fund will allow anyone, anywhere in the world, to participate in the value creation within the crypto asset category and to capture opportunity in new types of asset-backed tokens, anything from distressed real estate to solar installations to rainforest preservation projects and much more. Swarm turns financial opportunities from exclusive into inclusive via their Swarm Utility Network (SUN). Follow the Experts: Swarm allows experts to run their own syndicates and have other crypto investors join them in projects and deal opportunities, with no middlemen involved. This ecosystem of experts with any kind of edge (track record, trading ability, unique data, unique deal access, etc.) can co-invest with crypto investors. This changes the mechanics of the traditional fund/GP model, as investments can be as large or small as the investor wants them to be, and they can operate the fund structures very flexible. Also, it breaks up the syndicates of gatekeepers and rigid structures of institutional capital that exist today. Combine Token Flexibility with Real Opportunities: Crypto investors have appreciated the flexibility and immediate market-making function that tokenization has introduced. Tokens and their underlying smart contracts represent the ultimate opportunity of two parties to come together and interact without middlemen. Part of that is the freedom to trade or co-own tokens. That is the freedom we want to bring to any kind of asset class. When a participant likes an opportunity running on Swarm they will be able to pool funds together with others and invest as little or as much as they want to realize the project and see the opportunity grow. At the same time, all the projects become tradable asset-backed tokens. Participants can buy or sell these tokens whenever they want, and they decide how long to engage. All trades are made using blockchain technology, making them fast, transparent and secure. Collective Intelligence: The Swarm hypothesis is that decentralized networks can out-compete traditionally centralized entities and that the trust and transparency embedded in blockchains highly facilitate this. The foundational element of the blockchain is data transparency, which provides a basis for an unprecedented degree of machine-driven methods to generate insight. Swarm Fund envision a degree of investment automation, that helps participants make informed and data-driven investment decisions while using reputational scores to maintain the health of the market. However, the automation proposed goes further, where every step of the investment process, from workflows to set-up of legal structures will be automated over time, creating an efficient system without single points of failure or control. Unique to Swarm, Network democracy is a stake-weighted delegated voting system (liquid democracy) which also provides options for the enhanced stake and programmable liquidity. Liquid democracy allows for retention of capital control but flexibility to delegate decision making. Exchange Rate: When the sale starts the tokens base price is set at the Ether equivalent of one dollar. The first layer is a utility token which allows access to the underlying sub-tokens and grants access to the Swarm’s governance technology. The second layer includes financial opportunities run by Swarm syndication partners. Participants of SUN, Swarm Utility Network, will be charged fees, similar to those of a trading market (SUN Fees). 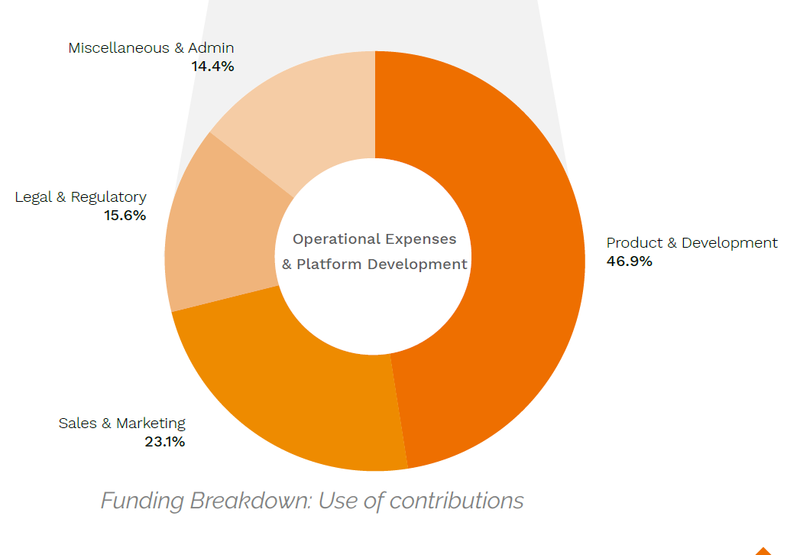 The principle for allocation of funds is that 25% of funds raised or $20M will go towards operational expenses and platform development. The remaining funds will be deployed towards the initial pilot fund opportunities. That way, a higher fund raise does not increase budgets for the operations of the foundation, but benefits the implementation and impact of the overall Swarm model.